I’m going to start off today and show you what Fed policy has given us over the last decade and a half. What the Fed has accomplished has been one bubble after another. We are obviously in the final euphoric parabolic phase of a third stock market bubble. When viewed with the benefit of the 200 day moving average as a mean regression line, it’s glaringly obvious just how dangerous this market has become. As history has shown, anytime the market stretches too far above the mean the forces of gravity eventually collapse price back to and often considerably below the mean. Yet despite thousands of years of evidence that parabolas are never sustainable, investors invariably get suckered into buying into these moves and get caught when they inevitably crash. This I can say with 100% certainty, this parabolic move in stocks is going to crash, just like every other parabolic move in history. The smart investor will wait patiently on the sidelines and once the crash occurs the low risk trade will be to go long as the Fed will attempt to reflate the market. This is a virtually guaranteed strategy to make money, although very few people will have the patience to wait for the trade to develop. The vast majority of traders will ignore the extremely risky environment, because his emotions make him think that he is getting left behind. He will buy into the parabola assuming that it will continue indefinitely (Does this sound familiar to the tech bubble and real estate bubble?). History however has shown that this is never the case, and buying any asset this stretched above the 200 day moving average always turns out to be a gamble as to whether or not you can exit ahead of the crash. If you miss time the exit, and most people do, you end up paying a heavy price for following the herd into a trade that you logically know is too risky. Once the stock market parabola collapses then the Fed’s endless money machine will generate another bubble in another asset class. I strongly believe the next bubble will be in the precious metals market. This entry was posted in Uncategorized on May 28, 2013 by Gary. This entry was posted in Uncategorized on May 12, 2013 by Gary. The euphoria phase of the bull market that I warned about months ago is now beginning its final parabolic phase. I’m guessing we still have another month-month and a half before this runaway move finally ends. Depending on how far above the 200 day moving average it ends up stretching, I think there’s a pretty good chance we will see the entire intermediate rally wiped out in a matter of days or even hours when this house of cards finally comes tumbling down. That is how these runaway moves terminate. They crash! Parabolas always crash. These things can go on and on for months and months with savvy investors becoming more and more nervous the longer the move persists. The longer the trend continues the more professional traders all position right next to the exit, until finally one day everybody tries to get out the door at the same time. It’s that mass exodus to lock in profits that triggers the crash. 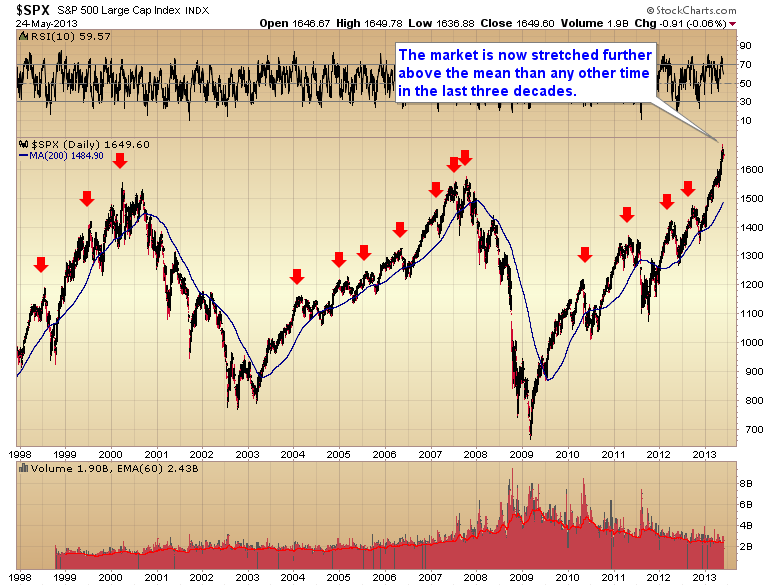 The magnitude is determined by how far and how long the market stretches above the 200 day moving average. Markets are no different than a pendulum. They oscillate back-and-forth above and below the median line, which in this case is the 200 day moving average. 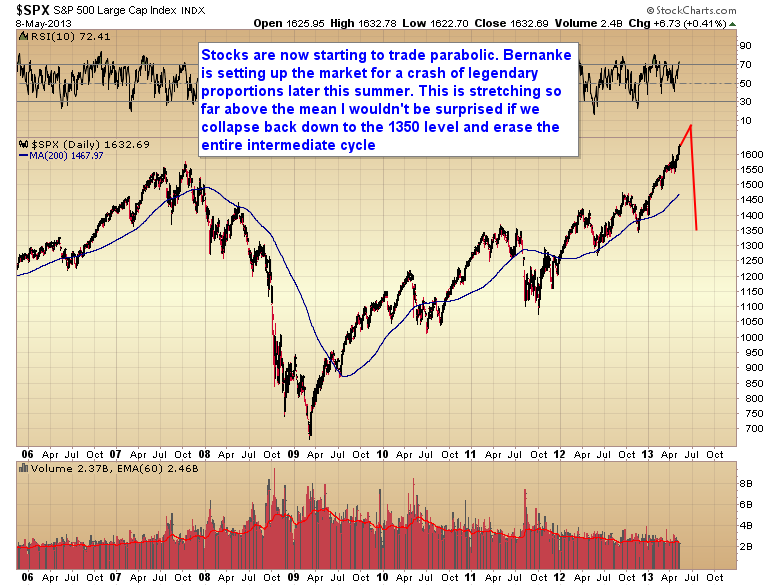 Bernanke is not doing anyone any favors by stretching the market unnaturally far to the upside. All it is going to do is guarantee an exceptionally violent move to the downside once the forces of regression to the mean break the parabola. Again I would warn traders not to try and sell short as it’s virtually impossible to determine when the parabola is going to fail. My best guess is late June or early July based upon the normal timing band for the dollar index to form its next intermediate degree bottom. As I expect the crash to correspond with a dollar rally that would seem to be as good a guess as any. For savvy traders the play isn’t to sell short, it’s to go long once the crash has occurred as the Fed will almost certainly double down on QE in the attempt to reflate asset prices. Of course the real play isn’t going to be in the stock market. The stock market is in the topping phase of this cyclical bull market. Yes the Fed may be able to levitate stocks back to marginal new highs, but the real money is going to be in commodities as all that excess liquidity will inevitably make its way into the undervalued commodity markets where the potential return is many multiples greater than in a very mature cyclical bull market in stocks with a weakening global economy. This entry was posted in Uncategorized on May 9, 2013 by Gary. I know a great many people have gotten discouraged during the last 6 months. Many have probably gotten knocked off the bull, and some may even buy into the end of the bull market nonsense that many analysts have been spouting lately. I can assure you the gold bull is not dead. Human nature hasn’t changed. Bernanke’s printing press hasn’t stopped. The Dow:gold ratio hasn’t reached 1:1 and the world hasn’t solved it’s ever growing debt problem. Gold just suffered a minor manipulation event after QE4 that drove price back below $1700 and held it there until the dollar rallied out of it’s intermediate cycle low. Then big money manufactured a stop run at the $1523 level to trigger a climax selling event. They used that panic to transfer I estimate somewhere between a quarter to a half trillion dollars worth of shares in ETF’s, mining stock, and physical from weak hands to strong hands. These players now have huge positions in preparation for either another leg up, or the final bubble phase of the secular bull market. If that’s the case then gold should rally for about another year and a half with a final parabolic blowoff top sometime in late 2014 or early 2015. A top in 2015 would culminate a 14-15 year trend which is about normal for a secular bull move. As hard as it is to do right now this is the time traders need to be positioning for the next, or the last leg up in this bull market. For the next couple of days I’m going to make an offer to any expired subscribers, buy one get one free. Buy a one month subscription and I will give you the second month free. This should be long enough to get you through the bottoming process and far enough along to convince everyone the bull market isn’t finished. At that point you can decide whether to let your subscription expire or continue. Make sure you let me know that you are a returning subscriber when you subscribe. I will email you instructions on how to turn off auto renew and get your second month free. This entry was posted in Uncategorized on May 6, 2013 by Gary. This entry was posted in Uncategorized on May 3, 2013 by Gary. The runaway move in the stock market that we have been watching over the last few months continues to stretch higher and longer. Let me emphasize again, these things always end badly. Usually in some kind of crash, or semi crash. I strongly advise traders not to chase this move. It’s way too late and risk is extremely high. If you don’t time the exit perfectly you risk getting caught in the crash. The way to correctly trade a runaway move like this, is to wait patiently for the crash to unfold, and then buy long as the Fed doubles down on QE in the attempt to reflate asset prices. The crash could happen at any time, but based on the intermediate dollar cycle, which is due to bottom in late June or early July, I’m expecting the stock market swoon to correspond with the dollar rallying out of that major bottom. 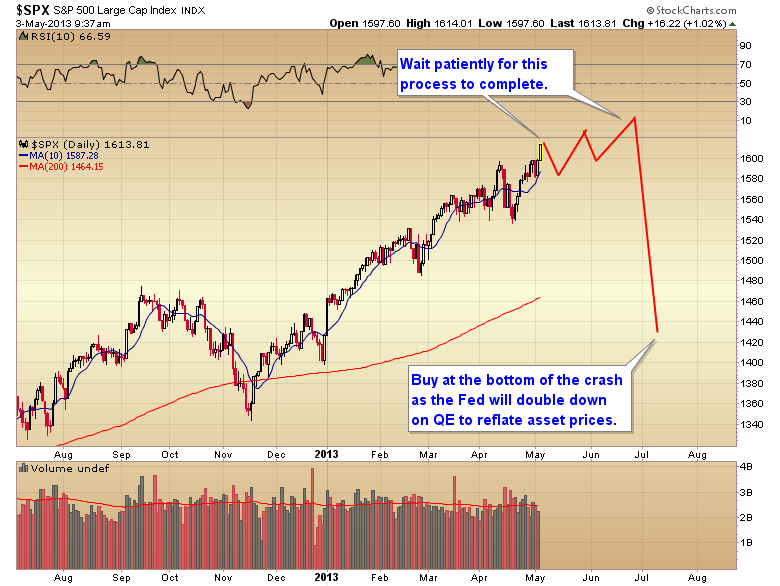 So my best guess is in late June or early July we will see this artificial rally come crumbling down. Let me emphasize that while I think the crash is going to occur later this summer, there is no guarantee it can’t happen sooner. On a side note: I heard a commercial yesterday in Las Vegas for a seminar on how to get rich flipping houses. Seriously? Are we really stupid enough to go down that road again?